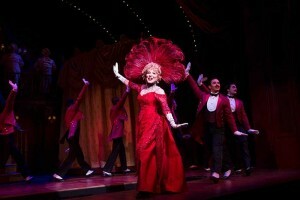 USA – Broadway’s latest revival of the ever-popular Jerry Herman comedy musical, Hello, Dolly! put Bette Midler centre stage as Dolly, the enterprising widow finding her way in an 1890s’ New York City. Directed by Jerry Zaks, with an expansively spatialised sound design by Scott Lehrer, enabled via TiMax SoundHub, the role saw Midler claim her first acting Tony award: Best Leading Actress in a Musical. The band also has five time-zones imaged separately across the stage. From the central conductor’s position, the left and right front zones map the front section of the orchestra. There’s also an up-left, up-centre and up-right orchestra zone. Lehrer uses this spread to distribute the orchestra across the sound system so that all the musical parts can be heard clearly. After laser measurement Lehrer trims his TiMax zone parameters manually, which is detailed work requiring close attention to the action, but he also tries to rationalise the quantity of cues for the sound operator to handle “because she still has to mix the show too”. Keeping the spatialisation cues to a minimum also lends their discreet and strategic use all the more impact, nevertheless Hello, Dolly! utilises around 100 timing cues, according to Lehrer, in a show with very few background sound effects. Each cue morphs actors’ mics seamlessly and transparently between the TiMax time zone level/delay imaging set-ups. As for what Scott Lehrer calls ‘manual tracking’: “We don’t do long sequenced crossfades too often as it’s hard to know how fast people will do things, but it’s a fun thing to try and using the matrix to enter the timings is very straightforward: as simple as putting numbers in a spreadsheet,” states Lehrer.